In “The Voyage of the Damned,” all our characters embark on the journeys that will define their arcs this season. Music historian Adam Knight Gilbert tracked down these pieces because they are wilder dances, more likely to be played in the streets than the more formal source pieces I had used for the Medici court scenes in the first season. I am very curious if fan watching the show for the first time fell for it. I have heard from friends that the illusion worked marvelously. 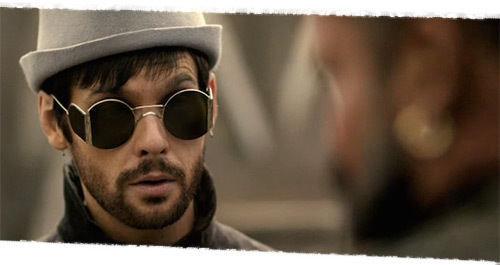 Tom Riley’s impersonation is spot on, and the spooky Riario Theme seals the deal. For the sword fights, I relied heavily on the chugging ostinatos in the Calder Quartet to provide the forward momentum. The small ensemble chugs away with aggressive sixteenth notes throughout these scenes, adding urgency. While the strings are relatively punchy, they are still not as aggressive as percussion. 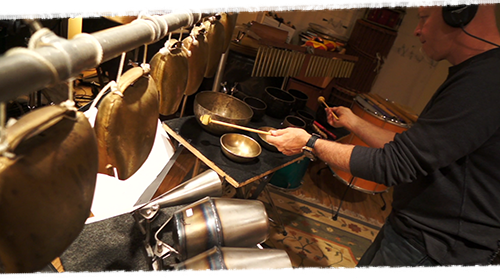 Their sound is soft enough that it doesn’t interfere with clashing sword sound effects, allowing the score to pop through the final mix better than if it were based in percussion and drums. The dynamic range of the string quartet is limited, which actually worked to my advantage because the dynamic range of the sound effects was so wide. I knew I couldn’t use dynamics or instrumentation to play the shifts in the combat, because the score would be struggling to be heard. Instead, I used harmonic modulations amp up the tension. If you watch the final sword fight with an ear to the score, you’ll notice that every major shift in power between the two men corresponds with a modulation in the score. As Da Vinci knocks a sword out of Alfonso’s hands, the score modulates up. As Alfonso regains his sword and forces Da Vinci back into a corner, the score modulates back down. 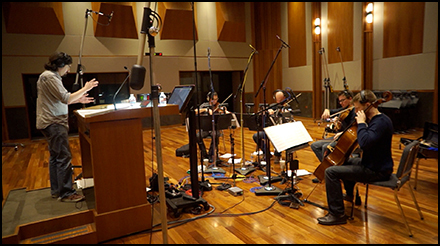 The string quartet provides a constant urgent backbone for the score and allows the sound effects to function almost like musical instruments themselves, providing shape and contour to the sequences. Despite the furious sword fights, the most memorable set pieces in “The Voyage of the Damned” are the construction and voyage of the Mechanical Fish. In real life, Da Vinci speculated about such vessels, so it was a thrill to see this appear in the show. I wanted the sequence to feel like a NASA rocket lifting off. Everyone gathers around, speeches are made and then brave heroes climb into a cramped space and risk their lives. I wanted to score this familiar kind of scene in a way unique to Da Vinci’s Demons. 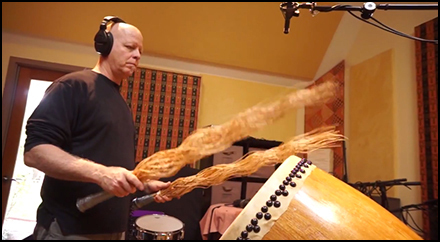 In place of pounding percussion, I wrote for a small hide drum to establish the energetic rhythm, along with the quartet. In place of low brass and concert basses, I wrote two passes of violine, a cousin to the viola da gamba that has a lower timbre and more closely resembles a bass. I intentionally wrote phrases that don’t quite fit the ensemble. The result is music that feels as if it wants to be bigger, but is still a little awkward and goofy. This approach was perfect to build excitement and simultaneously acknowledge the comedic adventure beats throughout the scenes. The most hilarious moment comes after the submarine dives into the water. The suspense builds as Da Vinci waits for them to find their buoyancy. For this moment, I wrote a triumphant fanfare for three crumhorns. The crumhorn technically hails from a bit later than the Renaissance, but nevertheless has a primitive, buzzing sound. 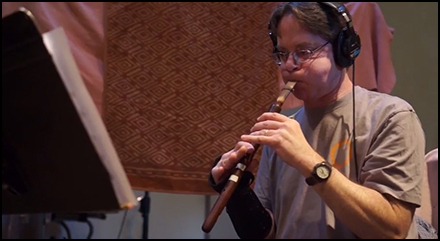 No offense to crumhorn players around the world, but the instruments sound a bit like kazoos. I had previously used crumhorns to great comedic effect in the LARPer comedy film Knights of Badassdom, and realized how funny it sounds when played in a triumphant style. As Da Vinci waits for his brilliant device to work, he is accompanied by what sounds like a triumphant three-part harmony kazoo fanfare. These are crumhorns, of course, doing what they do best. As the cue climaxes, the submarine hits the seabed with a thud and the score comes to a sudden, screeching halt. When we first see submarine closing in on the sunken shipwreck, a single clack of a clave pierces the murky atonal score and ambient underwater sound effects. I asked my mixer Steve Kaplan to soak the percussion in a long, cathedral reverb. Before long, a second hit cuts through. Then another, then another, with increasing urgency. A dissonant cluster in the string quartet glisses upwards as the submarine ascends, climaxing as the vessel narrowly escapes, while the percussion creates the feeling of an alarming sonar ping. My hope is that the audience is so conditioned to hearing this kind of sound during submarine movies that they don’t even notice it – they only feel escalating tension as the gap between the “pings” closes. “The Voyage of the Damned” also features prominent variations of the Lucrezia Theme, and the distinct Lorenzo and Clarice variations of the Medici Theme. All three themes are jammed together into the foreboding scene when Clarice confronts Lorenzo and tells him that Lucrezia was the Roman spy. This scene was tricky, because Elliot Cowan and Lara Pulver are two of the most subtle and restrained actors on the show, and my instinct is always to tread lightly with their themes. Furthermore, Clarice is saying what we’ve known since the first episode. From the audience’s perspective, this is hardly a revelation. For Lorenzo, however, this news crushes his world. The score had to aggressively underline his rage, and play the emotions in a big way. One of my favorite variations of the Lorenzo theme occurs during the shot following this scene, where Clarice watches her husband sneak out of Florence, disguised as a merchant. She looks down on him from their palazzo, her elegant dress in stark contrast to his dirty robes. Just one episode ago, I wrote the most epic variation of the Medici Theme I possibly could. Now, that melody is reduced to a duet of slithery recorders in parallel fifths that capture Clarice’s despair. Speaking of triumphant thematic fanfares, I wrote a big one for Da Vinci at the end of this episode. After he successfully convinces the former slaves of the Sentinel to join him on his journey, a rousing ostinato in the quartet prelaps the cut to the ship sailing off into the unknown. The journey of the second season is now underway. After an initial statement of the Turk Theme, this theme underscores most of their conversation, wailing on a fragile Yialli Tanbur doubled by an expressive duduk. The theme works on two levels. Da Vinci pursues the Book of Leaves and his actions bring him closer to his goal. For Da Vinci, the theme functions as the Book of Leaves Theme. 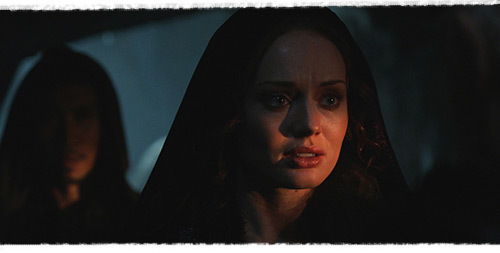 The Turk, however, contends that Da Vinci is straying from the course of time and may lead them all into further darkness. From Al-Rahim’s perspective, the theme represents a dire warning from the Sons of Mithras, and is not referencing the book at all, so for him it would be the Sons of Mithras Theme. For the audience, the theme functions in either capacity, depending on how they view the scene. Each episode this season has a unique End Credits piece. 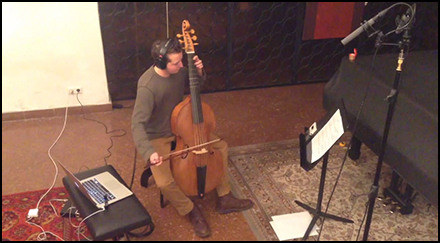 This week’s continues the mood with an ethereal ethnic variation of the Sons of Mithras / Book of Leaves Theme, played on a solo viola da gamba, above gently strumming lutes and a hypnotic hide drum. Between each melodic phrase, the ambient bells and bowls that have always represented The Turk offer ghostly tones, echoing into the darkness. The next episode introduces new challenges on our various characters’ journeys, and reveals essential backstory for one of the show’s most conflicted characters. I know I’m still pretty far behind with the blog entries here, but I’ll catch up soon, I promise!